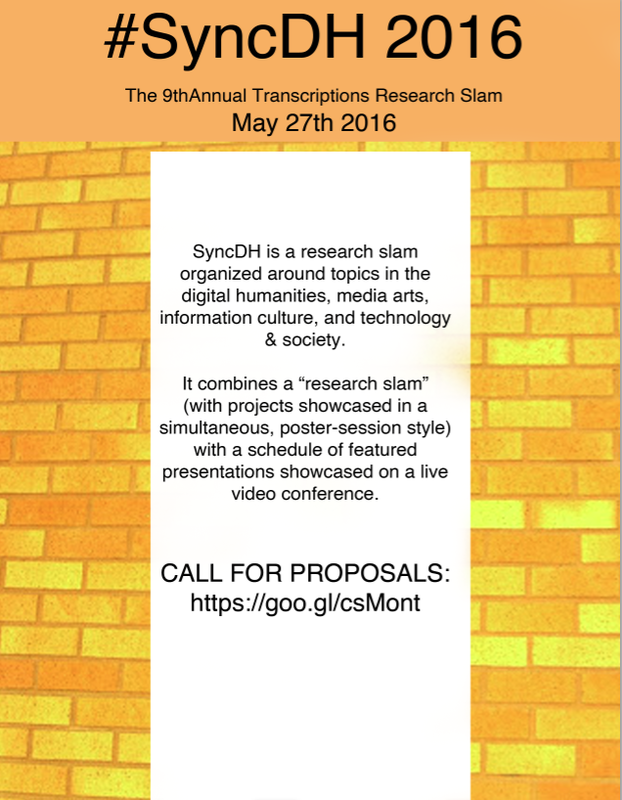 SyncDH is a research slam organized around topics in the digital humanities, media arts, information culture, and technology & society. It combines a “research slam” (with projects showcased in a simultaneous, poster-session style) with a schedule of featured presentations showcased on a live video conference. By streaming local and remote participants to and from the venue, the event aims to “sync up” local and remote DH research communities. It will be held both online and on-ground at UC Santa Barbara on Fri May 27th 2016. Registration is free; limited travel assistance is available to scholars in need. …or propose a non-standard format! “Local” projects are assigned a project station (PC+monitor) at the poster session venue. “Remote” projects are posted to the online event page. Accepted proposals (both local and remote) are assigned a “featured” time slot on the schedule for discussion in the online video channel. Proposals may request a particular time slot. Participants may be designated as respondents to featured projects; a response may be a brief (2-3 minutes) live reaction, or it may be written post (~250 words or 140 characters).